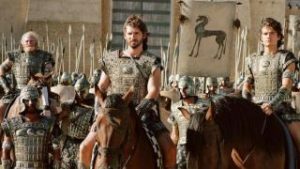 The movie version of the Iliad, which is the story of the Trojan War, this one features fantastic costumes and scenery, but the movie is too long and the story is a little too slow. 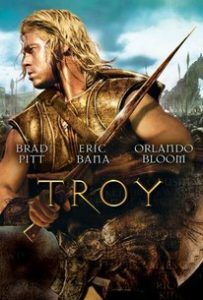 Troy is a movie that is meant to feel epic, like Spartacus, and doesn’t quite measure up to what it’s going for. It’s a fine movie, with some fantastic set pieces and costumes, and a cast that was top notch for the time, (although many of the actors featured have since fallen by the wayside, from Orlando Bloom to Eric Bana.) The movie is based on the classic Homer tale, The Iliad, and it is definitely a story that needed to be told. But this is hardly the best telling of it they could have done. It is focussed more on action than on characters, which would have been fine, if the action was all good. It’s not. The one on one fight scenes are strong, but the battle scenes are more for show than they are for actual well-choreographed violence. The movie does have a lot going for it, including a pretty clear first half, full of real motivations, but after a while, it does start to drag on and get way too long. The story here is about the kidnapping of a Queen. Helen is a Greek Queen, married to King Menelaus, and she is having a secret affair with one of the King’s guest, Paris (Orlando Bloom,) of Troy. Paris is there with his brother, Hector, (Eric Bana,) and each night Paris sneaks up to Helen’s room and has affairs with her. Considering that they are in the castle of another king and that all of the guards work for that king, and that this is the Queen we are talking about, so she would most definitely be guarded, it’s hard to believe that Paris would get away with this, night after night, without the King knowing about it. But this is the first of many plot oversights that the movie does not address. For example, it would have been more logical for Helen to have a secret passageway leading to her room that she told Paris about, where he enters through the wall each night. Some more precaution would have been nice. But this movie has an agenda and it doesn’t have time for small details, even if they would make the story better. It wants to hit every point of the Iliad and then some, and is way too overlong. The movie needed to cut certain scenes out in favor of others. I suppose it’s a good move then, that it avoids the whole story of Paris winning an archery contest of the gods, and winning the ability to have the most beautiful woman in the world fall in love with him. This movie doesn’t show the gods at all, other than by showing statues of them outside of temples, and having characters refer to them in dialogue. That elements works too. Pretty soon we are on the ships with Paris and Hector, heading back to Troy, and Paris brings Hector down below deck to see what he has done. A hooded Helen removes her garb to reveal her identity. Back on the ship’s deck, Paris and Hector has it out, with Hector at first wanting to turn back for Greece and return Helen to her husband, the King. Paris declares that he will not ask anyone to fight for him, but if they do turn back, then he is staying there with Helen. He will not send her back alone and plans to stay by her side. This, of course, means certain death for him, as soon as the King finds out what has happened. And with that declaration, Hector decides to bring Helen back to Troy after all. When they arrive home, we meet the father of the boys, King Priam, played by Peter O’Toole, a fine get for this movie. This is one of O’Toole’s last big movies, (he followed this with Ratatouille, voice Ego, and also Stardust,) and he does a nice job playing the aging King who has to stand by his sons while they throw the peace he has worked toward achieving, right out the window. Achilles is also only concerned about his reputation. Here, it’s more like his legacy through. It’s about how he will be remembered. He must be convinced by his good friend, Odysseus, (Sean Bean, playing the title character of Homer’s The Odyssey,) to join the Greeks in the battle against Troy. Achilles doesn’t care about the cause and the kidnapping of Helen at all. What he does care about is being remembered. And that’s what Odysseus uses to get him to sign up. He tells Achilles that he fights in this war, he will be remembered forever. Achilles goes to see his mother, and she pretty much tells him the same thing. She tells him that if he stays and does not fight, then he will have kids and grandkids and they will remember him. But after that, he will be forgotten. If he goes and fights, however, he will be killed, but his legacy will live on forever. And so the fights begin. The first one is another one on one battle. This one is between Paris and Menelaus. When Paris is about to face sure death, he retreats to his brother, looking pretty pathetic and not really caring. He just wants to live. And so Hector steps in and fights in his brother’s place. He kills Menelaus and then war breaks out afterwards. The one on one fight is cool, but the battle itself, between the two armies, is pretty ordinary. There is no attempt at giving us any kind of real choreography, like we got in the battles of Braveheart, for example. Here, the battles look more computer effects than anything else. This movie is all about showing off the scale of how big everything is, (how many ships are in the water, how many soldiers are in each army,) and in order to do that, it uses technology to computer generate extra ships or soldiers. The result is a pretty impersonal battle scene. And that’s pretty much the way the movie goes. When there’s a one of one fight, the choreography and action is worthwhile, but the giant battles themselves are pretty lousy. Luckily the movie does have its fair share of one on one fights. There’s Hector slaying Achilles’ cousin, and then Achilles coming after Hector for the big showdown of the movie. This is a fantastic fight, that takes place in different stages. First, the two men are armed with swords, shields, and spears. They end up giving up their spears. Then they give up their shields. And in the end, it’s a fight to the death with each an holding only a sword. This is the best fight in the movie, however, after it is over, the rest of the movie is all downhill. Everything that follows just slows the movie and pacing down. The second half of the film is far more dull and subdued than the first half. We stop caring about the characters as much once we realize that we are pretty much just watching the same scene again and again. There’s a battle scene and then a one-on-one fight scene. And the movie goes back and forth between those. The problem is that we really don’t know. who most of these Trojans are, which means they can’t die, because they are nobody’s who don’t effect the story. On the Greek side, we have Menelaus, Agammenon, Odysseus s, Achilles, Ajax, and Achilles’ cousin. Compare that to the Trojan side, where its really just Hector and Paris. This telegraphs that a lot of these Greeks will die, but not quite as many Trojans. And then there’s the Trojan horse itself, which should have been the highlight of the film. Instead, it is completely rushed by a quick scene of Odysseus seeing a man carving a horse statue for his kid. And that’s it. No scene of the Trojan horse idea being proposed, or discussion about how the Trojans will get drunk while the Greeks wait patiently to attack. We don’t even get a scene of the Greeks inside the horse, waiting. The biggest problem with Troy is pacing. The scenes that need more time are not given it, and instead, other pointless scenes (like all of the interactions between Achilles and the slave girl who is his prisoner,) exist, where they should have been cut. The movie is nearly two and a half hours long, and would have been far superior, had it been stripped down and tightened up. The one on one fights and costumes and sets are great, but the story is definitely lacking.